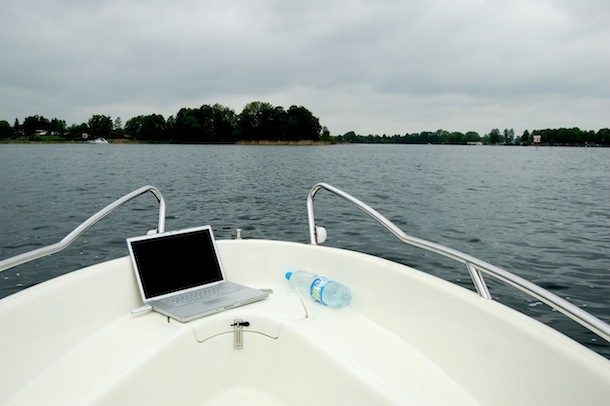 How’s this for the ultimate telecommuting setup: a MacBook Pro with a cellular modem… on a boat! This picture was sent in by one of our readers, unfortunately I don’t know where this is or what they do for work but I can certainly say I’m envious of this telecommuters office! I am a student and I am living in Germany. The lake you see is the Glindow Lake in the eastern part of the country, near Berlin. Working on the lake was not very good (as you can imagine). Especially because of the boat which is actually very small with around 12 feet (it is a Crescent 381 Free Time). But video-skyping with my girlfriend was quite nice . I was very surprised to see this Mac-Setup here, because I can say, that this is my setup :-). Working on the lake was not very good (as you can imagine). Especially because of the boat which is actually very small with around 12 feet (it is a Crescent 381 Free Time). But video-skyping with my girlfriend was quite nice :-). Thanks for posting my setup at my OSXDaily :-).